Custom made for The Studio & P.E.S., this Acrylic Paddle was designed around a standard round leather paddle. Of course, being made out of acrylic means that it is a lot less forgiving than a leather paddle when swung. Add in the air holes drilled in the paddle to cut down on the resistance, this paddle will deliver quit the impact when used. The handle is 8 inches long and about an 1-1/2 inches wide. The acrylic is approximately 1/4 inch thick. 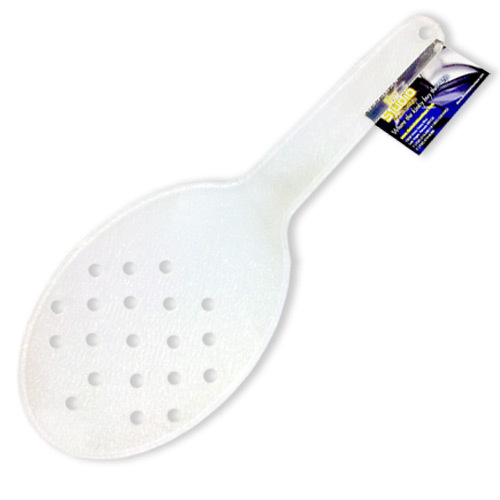 The round paddle portion is about 8 inches in length and about six inches across at its widest point. So in total length the paddle is about 16 inches long. Fantasy Becomes Reality I've wanted to play with handcuffs for a long time. I like the thought of .. 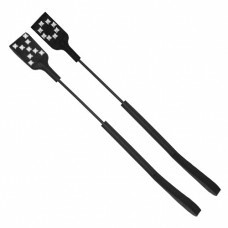 High-quality, tanned leather slappers have stitched handle and separate at the top. Called slappers .. Under Control Down on all fours.” I obeyed her command, knowing that this small act signaled the be..
Not a whip, but a tickler that will send shivers of delight down your partner's spine. Use iced or w..
Luxurious, genuine ostrich feather will keep the most shy partner from burying their head in the san..
Sensual feather-topped wand that will bend your partner to your will. A great toy for that 'kitten' ..
From tickle to sting, give the gift of tactile attention! Seven inches of high quality rubber strand.. High-quality, latex rubber strands are the heart and soul of these rubber whips. Strung through the .. This slapper is 26" long with a fiberglass shaft, plastic handle, and wrist loop. Leather slapper me.. Riding crop with a fiberglass shaft and a 1-1/4"W x 3" L leather slapper. Plastic handle with wrist .. Features & Benefits: The smooth side can be used as a traditional slapper and the studded..
To the Victor Go the Spoils Squealing and giggling she tries crawling over the furniture, clad only.. Features & Benefits: High quality, two sided black leather paddle with a soft furry side for us.. This flogger is pure evil. With a braided leather handle finished in turks-head knots, the falls on ..